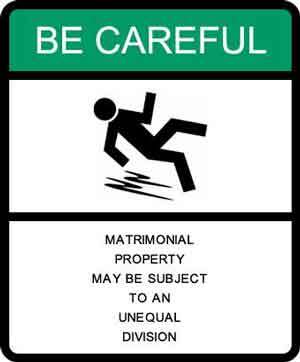 An equal division of matrimonial property does not always result in a fair division, for a host of reasons. One party may have taken on all the debts; in another case, a party may have racked up gambling debts and hid them in the mortgage on the family home. A gift or an inheritance may bring havoc upon the fairness of an otherwise "equal" division. "Equality is not always equity. Thus, in an application for division of marital property... a judge can order an unequal division ... if the circumstances of the parties are such as to make an equal division inequitable...."
Canadian provinces generally provide for an unequal division, but do so cautiously and under the banner of judicial discretion. "Child care, household management and financial provision are joint responsibilities of spouses and are recognized to be of equal importance in assessing the contributions of the respective spouses to the acquisition, management, maintenance, operation or improvement of marital property; and subject to the equitable considerations recognized elsewhere in this Act the contribution of each spouse to the fulfillment of these responsibilities entitles each spouse to an equal share of the marital property and imposes on each spouse, in relation to the other, the burden of an equal share of the marital debts." In Canada, each spouse is generally entitled to half of - by whatever name it goes by - all family assets, family property, matrimonial assets, marital assets or matrimonial property. Each province uses different terminology. In BC, lawyers speak of "determining and dividing family assets". In Ontario, the relevant statute requires one to speak of "equalizing family property". Determining what is and what is not a family asset, and therefore subject to the cleave of the judicial knife, is the first battle. "... any interest, present or future, vested or contingent, in real or personal property." "Property that the spouses have agreed by a domestic contract is not to be included in the spouse’s net family property." In other provinces, such as British Columbia, the relevant legislation provides also states what is a family asset, albeit with considerably greater plain language, and then sets out what is not a family asset. Once it can be determined what is within the pool of family assets, a presumption of an equal division usually applies. From that general theory to which all Canadian provinces subscribe, the Court can usually deviate if such a division is patently unfair. "... the Court shall distribute that property equally between the spouses unless it appears to the Court that it would not be just and equitable to do so, taking into consideration the matters in §8." Section 8 of the Alberta Matrimonial Property Act allows an unequal division in defined circumstances but then opens Pandora's Box by adding, lastly: "... any fact or circumstance that is relevant". Equivalent section are in place in other provincial statutes such as §65 of the British Columbia Family Relations Act which is entitled "Judicial reapportionment on basis of fairness" and which lists "the date when property was acquired or disposed of", as well as the catch-all "any other circumstances relating to the acquisition, preservation, maintenance, improvement or use of property or the capacity or liabilities of a spouse". "That one spouse has incurred a disproportionately larger amount of debts or other liabilities than the other spouse for the support of the family." ".. make a division of matrimonial assets that is not equal or may make a division of property that is not a matrimonial asset, where the court is satisfied that the division of matrimonial assets in equal shares would be unfair or unconscionable taking into account the following factors...."
The factors are similar but not identical to those of other provinces. Nova Scotia does not have a catch-all clause but it does explicitly include, inter alia, "the contribution by one spouse to the education or career potential of the other spouse (and) the contribution made by each spouse to the marriage and to the welfare of the family, including any contribution made as a homemaker or parent." In New Brunswick, §7 of the Marital Property Act sets out 5 déja vu factors and then concludes with the penultimate "any other circumstances". The Family Property Act of Saskatchewan requires an equal division of all family property unless doing so would be "unfair and inequitable" and which thereafter includes, inter alia, "a tax liability that may be incurred by a spouse as a result of the transfer or sale of family property or any order made by the court." It is unfortunate that the law in regards to family assets or matrimonial property is not uniform within Canada, each province using different terminology and setting out, at least at first glance, different criteria for deviating from an equal division of these assets. This makes it difficult to keep a running record of the legislation in place from coast to coast. In any event, this article is just a primer and is only general legal information. If you have a real matrimonial asset question, seek legal advice within your province. There are so many loopholes and quicksand in this area of the law, and so much to lose by a careless or uninformed acceptance of a settlement, that you owe it to yourself to get independent legal advice! McLeod, J., and Malmo, A., Matrimonial Property Law in Canada (Toronto: Thomson-Carswell, 2006).